Dublin's climate is mild and very changeable. It is influenced by the Gulf Stream. Winter temperatures average 4°C-7°C (39°-44°F) and in summer between 16°C-20°C (60°F-67°F). There are about eighteen hours of daylight daily during July and August, only getting truly dark after 23.00. In May, one can expect an average temperature of about 15°C, with a 1/3 chance of rain on each day, so we include one disposable raincoat in your delegate pack. The population of Dublin City and County is almost 1.4 million. English is the spoken language throughout Ireland. Irish (or Gaelic) is the original native language of Ireland. Place names and signage are usually in both languages. The Euro is the only currency that is officially recognised as legal tender in the Republic of Ireland. Each Euro has 100 cent. Tourism. Dublin Tourism Information and Reservation Centres can be found at Dublin Airport, Dún Laoghaire Ferry Port, Suffolk Street and O'Connell Street. 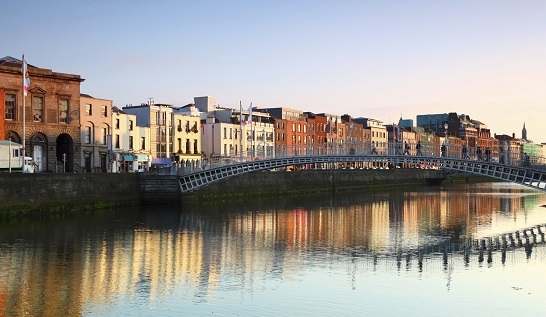 Call into one of their offices and let the experts guide you around Dublin. For more information about Dublin see visitdublin.com.